Heat is the enemy of performance. Keep temps down and performance will go up as a result of increased efficiency. It’s really as simple as that. Some may ask why change the heat exchanger and not the intercooler itself? Wouldn’t it be more beneficial to go directly to the source of the charge air? The simple answer is yes, but at a cost. The stock system cools the intake charge by using a water-to-air intercooler, an expensive piece to engineer. The cooling circuit for the water that feeds the intercooler uses a primary cooler (heat exchanger) and a smaller secondary cooler in front of the passenger side wheel. Through rigorous testing of all 3 of those components and multiple combinations therein it was discovered that the most effective performance per dollar solution was replacing the heat exchanger with a larger unit. Further testing focused on the heat exchanger produced the optimized design you see before you. With 60% more volume and 19% more face area than stock along with being a whopping 40mm thick (24mm thick stock) it becomes quickly apparent how heat soak is averted with the improved setup. While the unit could be physically thicker the 40mm dimension was ultimately chosen with consideration of airflow requirements of the main radiator which is located directly behind the heat exchanger. A thicker core would diminish airflow and sacrifice normal engine cooling which would be potentially detrimental to the long term health of the engine. 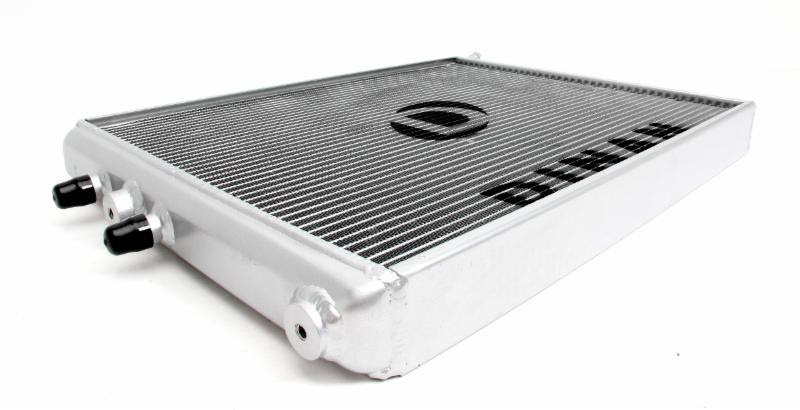 The increased physical stature of the heat exchanger allows reduction in water temperatures to the intercooler an average of 9° across the RPM range. The colder water entering the intercooler then improves is efficiency and allows the intake air to be cooled by an additional 6° average across the RPM range compared to the stock unit. The reduction in intake air results in an impressive +10 HP and +20 ft-lb of torque gain without any changes in the engine tune. Consistent +10 HP / +20 ft-lb of torque on the stock engine tune. 9° average water temperature reduction to the intercooler across the RPM range. Colder water improves intercooler efficiency and allows the intake air to be cooled by an additional 6° average across the RPM range compared to stock.